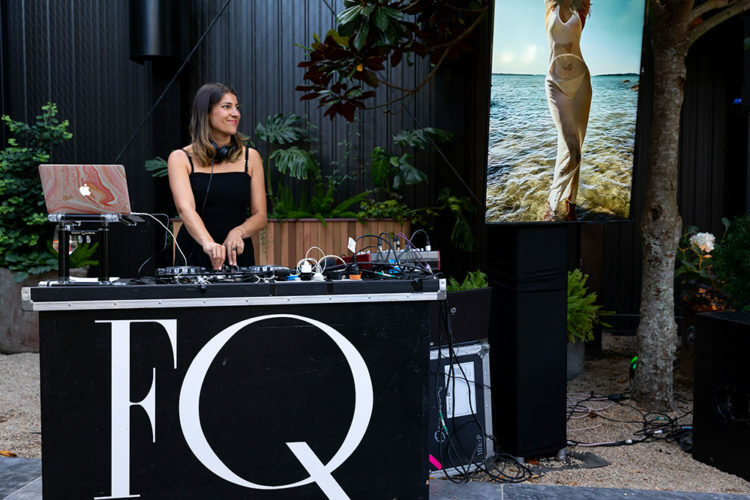 In an effort to park the Christmas madness and take a moment to celebrate summer, FQ transported friends of the brand to a garden party in the Hamptons to showcase the fashion, beauty and lifestyle trends set to shape the season. And by Hamptons, we mean the brand new venue Glasshouse found in Morningside, Auckland — which was more than fit for the job. The day was scattered with downpours and thunder, but as the guests filtered into the venue, which was clad with ceiling-height greenery and blooms at every corner, you’d mistake it for a balmy evening on Long Island’s South Fork. The clouds lifted, revealing a hazy blue sky, and the FQ Summer Party was on! Superior sounds c/o of our DJ Alisha and her fresh Sennheiser headphones instantly alleviated the stress from the day gone by, as did the refreshments (which really were refreshing) from Lillet, Mumm and Nakd artisan water (and later Duck Island ice cream). Oh, and if you didn’t get the reference, Lillet is the summer spritz choice of Jackie Kennedy… If that doesn’t say summer in the Hamptons, we don’t know what does! When guests weren’t found lounging on the white linen and teak furniture from event decor go-to Raj Tent Club, you’d find them swanning around the Vege Bang Bang food truck (if you know, you know) or getting close-ups with the models in the pop-up studio where Stephen Tilley was photographing a special FQ summer trend guide. Summer was officially in the air. As was a tonne of Jimmy Choo’s latest fragrance Fever. Simply sublime. The energy was at an all-time high as a handful of models strutted through the crowds wearing the latest trends curated by fashion editor Danielle Clausen – think tweed capris, retro swimsuits, printed shirts and pops of colour via block heels and resin sunglasses – before heading to the pop-up photo studio where the shots were instantly projected on screens around the venue. Long shiny tresses were pulled into ponytails and tied with oversized white bows thanks to the team at Cloud Nine and EVO, while makeup was daytime-dramatic: a simple winged liner complemented by a clean complexion and a glossy lip created using MAC products. And that enviable healthy glow? St Tropez Extra Dark tanning mousse of course. *Adds to cart*.